Technology is part of our children’s lives beyond the fact that they carry a different “chip” from ours who are digital immigrants; our young ones are born in a digital context. 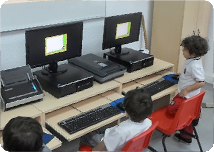 As part of the constructivist model of our school where the context of the child is essential, we must include the use of technology as a tool in the teaching-learning process. Preparing our children in "life skills" requires digital tools, hence our understanding that the time spent should focus on using technology to "learn how to learn". The transformation to a digital environment does not seek replacing but redefining the way we teach, and it does not eliminate the basic skills that promote psychomotor development and those experiences related to exploration and world knowledge, but enriches the way in which the child learns by finding a balance and synergy between the use of technology and the development of basic and fundamental skills in Preschool. In Preschool, we seek to provide them with learning strategies, using natural science, Spanish and math as the subject matter in an enjoyable and entertaining atmosphere.